Insanity has at last claimed Deadman as he embraces madness to escape the loneliness of his existence. For the first time, Boston Brand truly becomes a ghost in heart and mind, bitter and vengeful and ready to wreak havoc on any living person unlucky enough to cross his path. 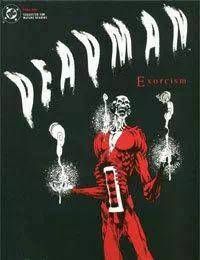 DEADMAN: EXORCISM revisits the angst-ridden world of Deadman in his new home, a deserted Vermont church - a church not even he realizes is the deadly nexus of an arcane convergence. Swept into that vortex along with him are the Phantom Stranger, Madame Waxahachie, a trio of evil spirits and a plague of demons seeking to escape from Hell.